The number one mistake that first responders make when trying to rescue a horse in an emergency situation such as a barn fire, is to expect the horse to know the responder is there to help, says Rebecca Gimenez, president of Georgia-based Technical Large Animal Emergency Rescue. Gimenez was speaking at a two-day large animal emergency rescue awareness training program organized by Equine Guelph at the Grand River Raceway in Elora, Ont., earlier this month. 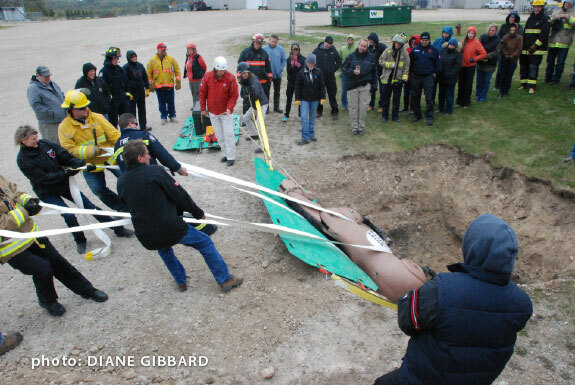 The raceway allowed a 15-foot-deep pit to be dug on the property so participants could practice different ways of removing a horse mannequin that had &apos;fallen&apos; into the pit. The class was at capacity, with 90 people taking part, most of them firefighters, police officers, veterinarians and horse owners. Funding for the training came from the Ontario Ministry of Agriculture, Food and Rural Affairs and the Grand River Agricultural Society. The training covered techniques to rescue horses, as well other large farm animals such as cattle and llamas. The biggest danger to these animals is a barn fire. Gimenez says barn fires kill more animals every year than any other non-medical cause, largely because barns are poorly designed. Many have old or uninspected electrical wiring, only one exit for the animals and no fire suppression system. The two-day course included hands-on work, including how to use a fire extinguisher, using a bra to blindfold a horse, and exploring the inside of a cattle transport truck, as well as techniques for moving horses out of various situations. The best way to deal with horses in a barn fire when stalls don&apos;t open directly outside is to chase the animals out through a clear aisle into a fenced-off field or ring, says Gimenez. Equine Guelph director Gayle Ecker says this course is part of a three-year plan to train first responders, veterinarians and others to deal with emergencies involving large animals. “Our focus at Equine Guelph is on horse welfare, and having people better prepared for these situations is definitely part of that,“ she says.